The San Bernardino County Sheriff’s Department in partnership with the Drug Enforcement Administration (DEA) will give the public its 16th opportunity in nine years to prevent pill abuse and theft by ridding their homes of potentially dangerous expired, unused, or unwanted prescription drugs. Bring your pills for disposal on Saturday, October 27th, from 10 a.m. to 2 p.m. to any one of the below-listed collection sites. The service is free and anonymous, no questions asked. Last April, the public turned in a record-setting amount of nearly one million pounds-nearly 475 tons of potentially dangerous expired, unused, and unwanted prescription druges for disposal at close to 6,000 collection sites all across the country. This brings the total amount of prescription drugs collected by DEA since the fall of 2010 to 9.964,714 pounds or 4,982 tons. This initiative addresses a vital public safety and public health issue. Medicines that languish in home cabinets are highly susceptible to diversion, misuse, and abuse. Rates of prescription drug abuse in the U.S. are alarmingly high, as are the number of accidental poisonings and overdoses due to these drugs. Studies show that a majority of abused prescription drugs are obtained from family and friends, including from the home medicine cabinet. Also, Americans are now advised that their usual methods for disposing of unused medicines—flushing them down the toilet or throwing them in the trash—both pose potential safety and health hazards. “Educating the public on the proper disposal of unused medicines has led to over 4,982 tons of prescription drugs being turned in. The success of this program is evident; I believe residents are aware of this every six-month service being provided to them and, they plan for it,” said Sheriff John McMahon. We encourage every citizen to look in their homes for any old, unused prescription medication and bring them to one of the listed collection sites for disposal. 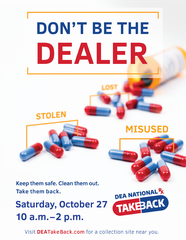 For more information about the disposal of prescription drugs or about the October 27th Take-Back Day event, go to https://www.deadiversion.usdoj.gov/drug_disposal/takeback/index.html.